Like the poor wayfaring stranger, the poet Czeslaw Milosz spent most of his life journeying through this world of woe. His childhood home of Lithuania ceased to exist after World War 2. It was swallowed up into Poland. He would sometimes say of himself, “I am a Lithuanian to whom it was not given to be a Lithuanian.” His life was marked by exile. In 1951, he defected from Poland and moved to France. By 1960, Milosz moved to America. The largeness of the American West attracted and haunted. The vastness of the natural terrain served as a reminder of his own smallness and transient existence. “Let us weep, lament the enormity of the loss. In another place, he takes up the ancient prayer, Veni Creator Spiritus, Come Holy Spirit, and prays for God to reveal Himself afresh. In a world where we are surrounded by doubters and cynics, many people may feel the same desire. I remember talking with a group of Christian friends and one of them wondered when we will see miracles like Elijah calling down fire from heaven. 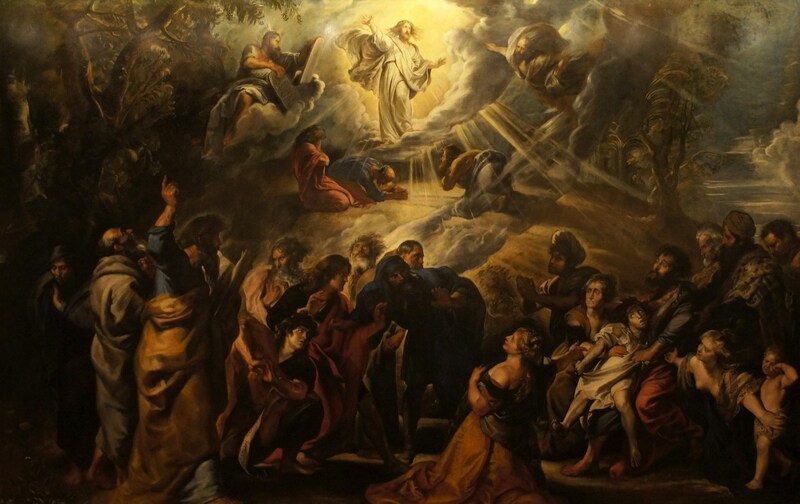 I am thinking about this longing to see God’s hand on this Feast of Transfiguration. This story today may help us to reflect on that glory. Jesus leads Peter, James, and John up a mountain to pray. Luke says, “As he was praying, the appearance of his face was altered and his clothes became dazzling white” (Luke 9:29). This glory is not shining down on him. It is shining out from him. Matthew says that his face shown like the sun. Even his clothes were dazzling white. In fact, Mark says that his clothes were whiter than the very whitest white (Mark 9:3). “12 Then I turned to see the voice that was speaking to me, and on turning I saw seven golden lampstands, 13 and in the midst of the lampstands one like a son of man, clothed with a long robe and with a golden sash around his chest. 14 The hairs of his head were white, like white wool, like snow. His eyes were like a flame of fire, 15 his feet were like burnished bronze, refined in a furnace, and his voice was like the roar of many waters. 16 In his right hand he held seven stars, from his mouth came a sharp two-edged sword, and his face was like the sun shining in full strength.” (Re 1:12–16). This vision is more detailed than the Gospels and is obviously at a different time. And yet, like the Transfiguration stories, John says that his face shines out like the noon day sun. As we behold the glory of the Transfigured Jesus, we behold the delight and the terror of absolute beauty. The complete and perfect form. Jesus revealing the Glory of God in man, in flesh and blood, in the physical world. This is embodied glory. We see a hint of this embodied glory in the Exodus story today. After talking with God in the cloud of glory, the face of Moses begins to reflect that glory. When Aaron and the people see Moses, “They were afraid to come near him” (Ex 34:30). Moses has to cover his face because human eyes cannot bear to see the unveiled beauty of the Lord. “[W]hen one turns to the Lord, the veil is removed. 17 Now the Lord is the Spirit, and where the Spirit of the Lord is, there is freedom. 18 And we all, with unveiled face, beholding the glory of the Lord, are being transformed into the same image from one degree of glory to another. For this comes from the Lord who is the Spirit.” 2 Co 3:16–18. The Lord has called out His people to reveal His glory. I want to briefly reflect on this embodied glory in Jesus and his people this morning. What does glory look like in a human body? This morning let’s briefly reflect on how our feet, our hands, and our head reveal God’s glory. Our feet keep us grounded so to speak. They literally plant us on this earth. In Scripture, when feet stand on holy ground they must be uncovered. The feet must touch the ground directly. The feet were made to walk on holy ground. It’s only after Adam and Eve violate God’s command that they are covered with animal skin. The shoe or animal skin upon the feet is removed as an act of respect and as a sign of grace. God is welcoming Moses as a guest back to the holy place. We have a similar image of bare feet when the priest minister in the Tabernacle, or when the soles of their feet touch the river Jordan, the Lord shall cut off the waters from flowing. The feet can stand on holy ground, balance us as we walk literally and figuratively in the way of the Lord. The feet can walk toward those in need. The feet can also walk in the counsel of the wicked, stand with sinners and sit with scoffers. The feet can walk toward communion and toward relationship or walk away from love. The feet are washed and anointed as a sign of hospitality and grace. The feet give us the ability to move through this world, and we can walk toward the light or walk toward darkness. Where Jesus walks, the disciples follow. Their feet are actually, physically learning to walk in the way. The feet of Jesus reveal His authority. Walking on water is a sign of His rule over creation. When the woman washes His feet with her tears, she is recognizing His kingly position. The most quoted Old Testament text in the New Testament is The Lord says to my Lord: “Sit at my right hand, until I make your enemies your footstool” (Ps 110:1). Jesus’ feet reveal His authority, His move toward people in need, His faithfulness to bring Good News to those in need. When we go forth with the Gospel of Jesus Christ, we go forth with feet shod in the Gospel of Peace. Our feet reveal God’s glory in the physical places we walk as well as the symbolic path of love and kindness that we walk upon. Christ in us is revealing His rule and grace through our feet. Look at your hands. Our hands are amazing tools for building, creating, soothing, directing, giving, blessing, praying, and worshipping. Of course, the same hands can make a fist, destroy, create an idol, steal, and wreak all manner of evil in the world. Jesus extends his hands in blessing. He washes feet, He heals blind eyes, withered hands, lame feet, and even those oppressed by demons. His hands are restoring God’s good creation. Jesus breaks bread for the multitude and later for his intimate disciples. His hands welcome his followers into intimacy. His disciples are beholding the glory of God in the extended hands of Jesus. The head is usually the first thing we engage with a person. It is the focal point of the body, and when speaking of Christ as head of the church, Paul says that the head unites all the members of the body. Think about the element of our head: eyes, ears, mouth, nose, hair. We look into the eyes, we listen to the voice. The head is the glory of a person. All five senses are at work in the head. Hearing, smelling, tasting, touching, and seeing. Scripture will speak of five senses in the worship of God. But the eyes can become darkened. The ears can listen to a false report. Life and death are in the power of the tongue. God speaks the world into existence. Yet we can also speak words of hate and deceit. James writes, “the tongue is a fire, a world of unrighteousness” (Jas 3:6). This tiny instrument of utmost power can bless but can also despise and curse. Jesus embodies the glory of God in his words, his actions, his movement. Today we behold His light shining out light the noonday sun on the mount of Transfiguration. His body reveals the glory of the Father. But there is a greater glory he will reveal in this body in these feet, these hands, this head. In John 17 as Jesus prepares to the go to the cross, he prays, Father, the hour has come; glorify your Son that the Son may glorify you…” (Jn 17:1). And again, “I glorified you on earth, having accomplished the work that you gave me to do. And now, Father, glorify me in your own presence with the glory that I had with you before the world existed. (Jn 17:4-5). This is the glory of pouring out his life for the world His feet and hands will be pierced. His head will be crowned with thorns. His eyes will weep blood. He will hold nothing back. This is the glory of the unrestrained love of God that does not abandon us in our sin but rescues and bears our shame, our transgression, our sickness. Today we celebrate the glory of Jesus Christ unveiled on the Mount of Transfiguration. Even as we behold him, we know He has called us to share this glory, to live from glory to glory. To reveal His life and love and blessing in our feet, hands, ears, eyes, and mouth. We also remind ourselves of the love of God fully unveiled in His life poured out on the cross. And we remember Jesus’ words before his unveiling on the Mount, “If anyone would come after me, let him deny himself and take up his cross daily and follow me. For whoever would save his life will lose it, but whoever loses his life for my sake will save it” (Lk 9:23–25). And we hear his call afresh to follow him in our feets, hands, and head all the way to the cross. Czeslaw Milosz, Second Space, HarperCollins, 2004 (p. 3).